How do you illustrate a poem about a dying man without simply showing a photograph of a wrinkled face with weathered eyes? This is the enterprise of the students working with Spindrift as they come down to the last two months of compiling the award-winning art and literature journal (or magazine as some call it). A single person can approach the business of making music in a number of different ways, so many in fact that sometimes the people who are there at the very beginning can be forgotten. The Shoreline Music Department created Singer/Songwriter Night to recognize the people who are there with the music before the recording, producing and mastering that goes into a creating a song. Having problems finding the right playlist? Do you have so many songs that you can’t figure out what to listen to? Maybe you want instrumental songs while you are studying or energetic songs while you are working out. Songza can help you find the perfect music. 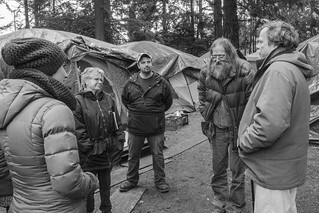 Visiting Tent City 3: Fisher and students listen as residents explain their living situation. I’m always open to new foods, but when Jamaican food came to mind I didn’t have an example of it, nor an example of a restaurant that serves it. Enter Taste of the Caribbean. Located in the Central District, it’s one of the only restaurants in Seattle that serves authentic Jamaican cuisine, with many of their unique ingredients imported directly from Jamaica. 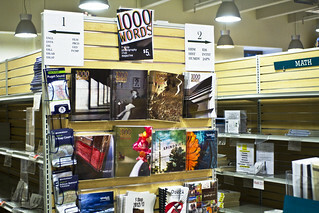 The Photo Club's magazines on sale at the SCC Bookstore. Are you an iphoneographer? Do you want your photos to come out looking like you took them with a DSLR camera? Do you want more ‘likes’ on Instagram? Here are two apps that don’t require Photoshop or an expensive camera and can make your pictures look perfect! Let’s be honest here...who doesn’t love a good bowl of pho on a cold day? This Vietnamese noodle soup has a cult following in Seattle, every neighborhood has at least one joint to cater to all of the diehard fans. I decided to break from my usual pho place and visit Pho Mimi, a hole-in-the-wall on 127th and Aurora. I was greeted by the only server/host/busser there and asked if I wanted hot tea or water. I opted for tea and took a seat, the interior looked only slightly better than the outside.